first impressions say a lot about your brand, and surprisingly, i was recently disappointment by a brand that is so well positioned, built, immersive, engaging, and protected that i thought it would have done a better job with the first experience. these details center around the user experience. while both are small; combined they speak volumes. and as an email marketer make me cringe. i wanted to know more about "fantastic beasts and where to find them" and surfed over to pottermore to grab a digital copy of the book. the site is the immersive web property for fans of the wizarding world of harry potter. a repository of everything potter and i was excited to sign up. i went through the registration process and got my confirmation email. time to explore harry's world - or so i thought. checking my inbox, i fully expected to get an email with a from name of one of the characters or someone from the ministry of magic. instead of an email from a wizard, the ministry of magic, or even jk rowling herself, i found this, that's right, the i found an email from "noreply". why is this so bad - and does it make a difference? in the "muggle world" using "noreply" says to your reader that they should be an observer of your product -- that you aren't interested in them as a consumer and that communication with the brand is a one-way street. pottermore on the otherhand is a community, therefore, by design it is supposed to allow the member to interact with the wizarding world, this is not a one-sided experience. but the wizard in charge just said to me that my engagement with this community is going to one-sided. this wizard has broken the fourth wall so to speak and has punched a whole in the theme and experience. i opened the email, and my heart sank. 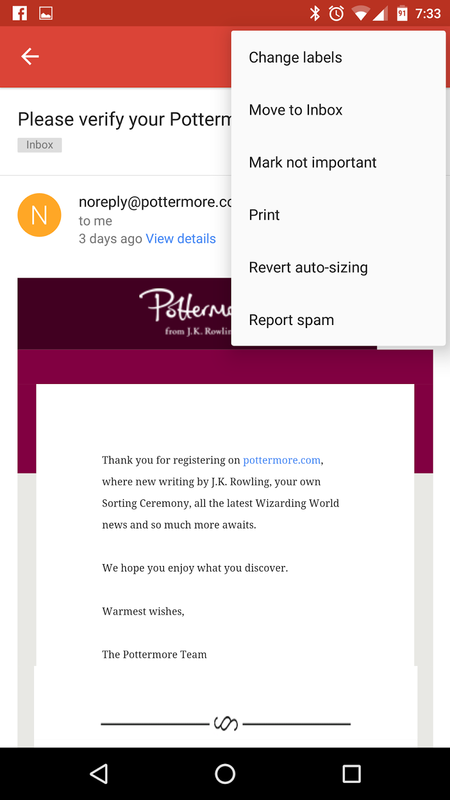 i signed up for pottermore on my smartphone, a nexus 6. i use the gmail app for my email. admittedly the gmail app delivers a sub-par mobile adaptive experience, but a passable mobile experience can be forced with a little creative coding. something that any wizard of email marketing can figure out. pictured left is the email. while not the worst mobile rendering of an email i have gotten, it is none-the-less, still not rendering properly. as an android gmail user, i've learned to live with these kinds of emails, and they are just part of the experience, but there are telltale signs that they tried, and let's face it, no amount of magic can seem to make adaptive emails display properly in the fragmented world of android. but what bothers me the most about this, is that they tried to make it adaptive and then just gave up. if you look at the different sections of the email, you can see that it is broken into different content blocks, and that the different content blocks are pushing the design of the mail to different widths, and that to me is distracting. put it in one content block/table and call it a day to avoid this type of experience. there is a trick with android that will help fix this. i hope most users know this by now. it is the "revert auto-sizing" option in the drop-down menu, illustrated on here. 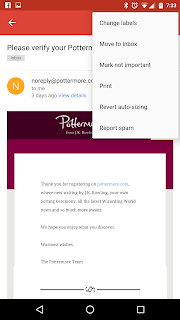 this option in the android world takes away the adaptive nature of the email and forces it to fit within the screen of the device without any re-sizing and allows the reader to zoom in and out by pinching to read the text and take action. it's not the best solution, but for the reader it is much less visually distracting, and the emails will make more sense. a few years ago, i was able to attend an exact target user's group meeting in washington, d.c. where matt byrd (then of litmus) told those present that email subscribers were more likely to unsubscribe from your emails if the landing pages, pages, and forms you were driving them to weren't mobile friendly. that's a statement i can accept. it makes sense, that the email experience on the mobile device (aside from an apple device) is at time abysmal. people have learned to live with it, which is probably why gmail won't support responsive design and a better experience (don't get me started), but they have come to expect a pure mobile experience on their mobile browsing and to go from email to mobile it must be mobile responsive. in this case, i have to say that reverse for me is true. if your site is a membership driven site, that uses double opt-in and your emails aren't mobile adaptive, then i'm not going to complete my membership. it was these two "over sites" that caused me not to finish my "enrollment process" with pottermore - i didn't even go through the sorting hat ceremony to see which house i would be in, and i haven't been back to the site since this experience. i simply bought the hardback book from target when i was out that weekend. and i'll wait with much anticipation for the movie to come out this fall. the moral of this story is not overlook the small details, they can make a big impact on your brand and the user experience and journey you want your customers to go on. in this case, they took me from excitement to know more about the wizarding world to not even going back to 'king's cross station' to board the hogwart's express again. okay i'm bending the truth, we all know i'm heading to universal studios florida in a few days to wander around hogsmeade and diagon alley and drink butterbeer, but i won't be heading back to pottermore anytime soon.